Our Egghead cooks will be the Guests of Honor at a special Pre-Event Party on Friday, April 13th. Sponsored in part by First State Bank of Athens. Each cooking team will be provided with one Large-sized Big Green Egg Demo Egg and a bag of charcoal. Should extra BGE’s prove to be available, they may be requested by your cooking team on the day of the event. Cooks are responsible for providing all other necessities including primary ingredients, spices, and utensils. Thanks to the generosity of Brookshire’s Grocery, each of our primary Egghead cooks will receive Brookshire’s gift cards to help them in purchasing their supplies for the event. Then, on the day of the event, Brookshire’s will have staff members on hand to make trips to/from the store with any last minute needs you might have. Following the close of the 2019 Athens Eggfest, ONLY our Egghead cooks are invited to the traditional “After” Party. During this event, all of our cooks prepare their favorite BGE recipes and make plans on where they’ll be meeting up next! A complete run down on What it takes to be an Egghead Cook may be found HERE. 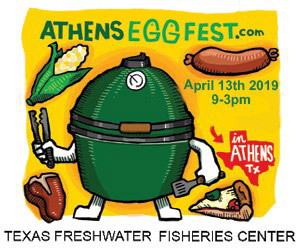 To register as an Egghead cook at the 2019 Athens Eggfest, simply complete the form below and click Submit. There is no fee to register as a cook, but REGISTRATION IS LIMITED TO THE FIRST 30 COOKING TEAMS. For our cooks traveling from out-of-town, please consider staying with one of our preferred lodging providers, found HERE. Directions to the Texas Freshwater Fisheries Center may be found HERE. Representing the following Business/Company . . .